As my colleague Ankit noted yesterday, Prime Minister Shinzo Abe’s tour of Bangladesh and Sri Lanka that began on Saturday is already bearing fruit in the security and economic spheres. The most important security deal to be struck during Abe’s trip has been Bangladesh agreeing to withdraw its candidacy for a non-permanent seat on the U.N. Security Council for the Asia-Pacific region in October 2015. Abe appears to have successfully leveraged Japan’s recent substantial economic assistance package into an uncontested regional bid for the Security Council. During Bangladeshi Prime Minister Sheikh Hasina’s visit to Japan in May, she indicated that Bangladesh could withdraw its candidacy in light of Japan’s recently announced economic package, worth roughly 600 billion yen ($5.7 billion) in aid, loans and investments. In addition to the $5.7 billion in loans to Bangladesh promised when Hasina visited in May, Abe confirmed plans to invest in the construction of a major industrial district around the Bay of Bengal. Last month Japan announced $4 billion in economic assistance for both a deep-sea port and a large coal-fired power plant, with Dhaka also hoping Japan would invest in a railway bridge over the Brahmaputra River, as well as a tunnel under it. With Bangladesh withdrawing its bid, Japan will be the only candidate from the Asia-Pacific. Speaking with Abe after their bilateral summit at a press meeting, Hasina said “the decision was made for the unity of the Asia-Pacific region.” Sources who spoke with the Yomiuri Shimbun said that it is common practice to keep the placement non-competitive for non-permanent seats. Japan has already been on the Security Council more times than any other U.N. member with 10 placements. Should Japan gain the two-year rotating seat, it would start at the beginning of 2016. Given its experience in the Council, Japan likely has several goals for its tenure, two of which it has already floated publicly. The first is to “gain an advantage in gathering important information sooner by participating in closed discussions that give a sense of the direction that the international community will take,” according to the above Yomiuri article. Another is to advocate for reform of the Security Council itself, to include Japan, Germany, Brazil and India as permanent members. There is already considerable international clamor for reform, particularly in regions like Latin America and Africa that have no representation. 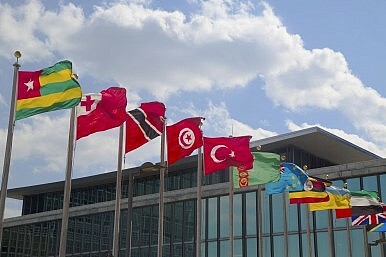 However, each of these countries faces opposition from current permanent council members. Japan will certainly use the opportunity, should it gain a seat through the requisite two-thirds approval from the General Assembly, to advocate for reform and to “lead in efforts to change the United Nations into a desirable form for the 21st century,” according to Abe. Yet China alone will probably be enough to derail these prospects for Japan, as it has no interest in seeing Tokyo on equal footing with Beijing in the world’s most powerful diplomatic forum. However, that will likely not deter Japan from using its non-permanent seat to not only push for reform, but also use the international “bully pulpit” to press for attention on regional issues. In particular, it may use the Security Council to press China on adhering to international maritime law in the South China Sea, in direct opposition to Beijing’s insistence on the “nine-dash line” as the basis for territorial boundaries in the region. Japan and the U.S. are already working with ASEAN members like the Philippines and Vietnam to bring China and the region into agreement on a Code of Conduct for the South China Sea. While Japan’s ambitious goal of Security Council reform may draw more attention should it gain another non-permanent seat, its practical actions to improve its position and maneuver against China in the region will likely have a much greater effect.